On behalf of the Eugenia B. Thomas K-8 Center School family, I would like to extend a warm welcome to you and your child(ren). We look forward to another successful year! 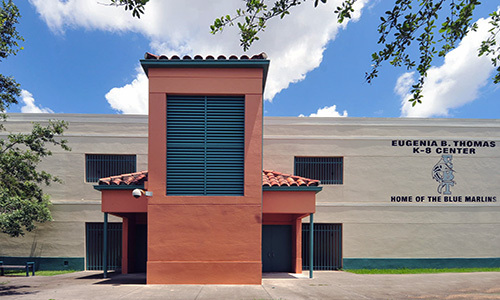 I am extremely proud to announce that for the twelfth consecutive year, Eugenia B. Thomas K-8 Center is an “A” school as recognized by the Florida Department of Education. Our exceptional staff and students have worked tirelessly to reach educational excellence and we pride ourselves in being a place where our mission is to ensure every child’s potential is achieved. As reflected in this year’s theme “One Team, One Goal: Success”, I ask that we work together to provide a safe learning environment where all students will continue to academically soar in the pursuit of educational excellence. I look forward to working with you and in celebrating more achievements with our EBT family!